Prominent & Leading Manufacturer from Mehsana, we offer concrete mixer with mechanical hopper, mini concrete batching plant, concrete mixer without hopper and concrete mixer machine with hydraulic hopper. 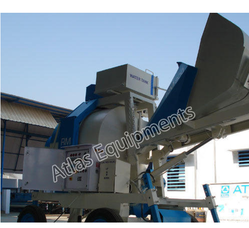 As the leading manufacturer, exporter and supplier, we at Atlas present Concrete Mixer with Mechanical Hopper. It is preferred by civil contractors who are looking for a reliable and rugged machine for their sites. Our offered concrete mixer is stringently tested by our quality controllers as per with industry standards. The main advantage is that it is very easy to transport this equipment to different places without hazzles. Production of concrete is possible in quick time. 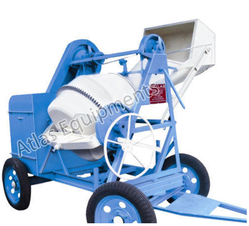 This concrete mixer can be customized as per the need of our esteemed clients. Maintenance part is very easy and it is designed that anyone with basic skills can operate and maintain this equipment. Capacity 8-9 / 12-13 m3/hr. We have cut specialty in the business by giving a creative arrangement of Mini Concrete Batching Plant. Our offered solid blender is accompanied separate weighing for two sorts of totals water & concrete. This cement blender is given on a few particulars as indicated by the needs of our benefactors. Offered solid blender is accessible in various altered alternatives at reasonable cost to our prestigious customers. By utilizing vast experience, we have been able to offer a qualitative assortment of Concrete Mixer without Hopper that can be easily towed by the help of a tractor; our offered concrete mixer is simplest of road cleaning equipment. This concrete mixer is designed with best quality of material & leading techniques. Offered concrete mixer is easily availed from us at very reasonable price. By keeping the pace with the current market standard, we are engaged in providing an exclusive array of Concrete Mixer Machine with Hydraulic Hopper. The offered concrete mixer machine is manufactured by a team of proficient professional by utilizing excellent quality material and current technology in adherence with market prevalent norms.